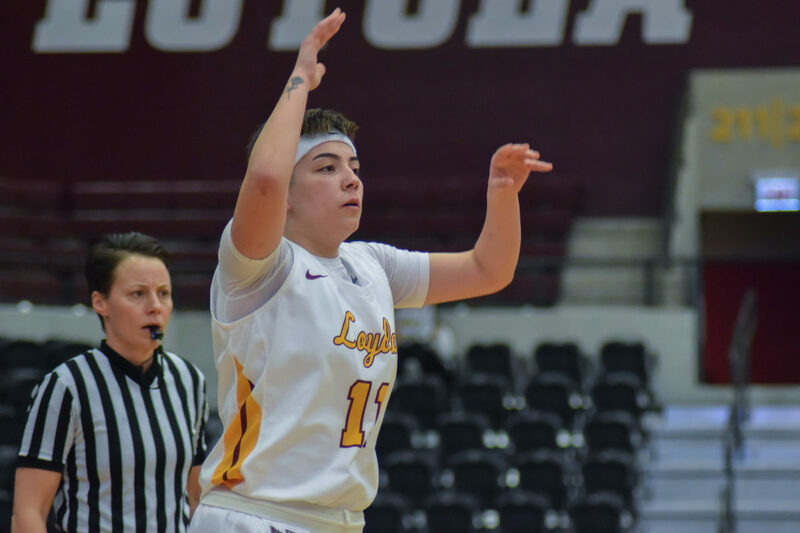 Nick Schultz | The Phoenix Loyola first-year guard Janae Gonzales had a team-high 18 points against Drake Feb. 10. The Loyola women’s basketball team (10-11, 4-7) fell to Drake University 83-55 Sunday afternoon at Gentile Arena for its third straight loss. Loyola first-year guard Janae Gonzales led the team with 18 points and dropped five three-pointers. Sophomore guard Abby O’Connor and first-year forward Allison Day followed up with 10 points each. Drake, which ranks tied for second in the Missouri Valley Conference (MVC) and received three votes in the latest Associated Press poll, improves to 18-5 overall and 10-1 in MVC play with the victory. The Bulldogs were led by guard Becca Hittner’s 19 points, six rebounds and seven assists. Drake took a quick 12-2 lead in the first quarter and extended the advantage to 27-13 after the first 10 minutes. The Bulldogs then went on a 12-0 run over 2:30 of the second quarter and led 54-29 at halftime. Loyola continued to struggle in the third quarter, scoring just six points in the frame to trail 73-35 heading into the fourth quarter. The deficit was too much for the Ramblers, though, despite 20 fourth-quarter points — continuing a season-long trend of strong finishes. 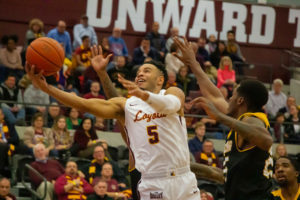 Achter said she shouldered the blame for Loyola’s sluggish performance, saying she didn’t feel the team was well-prepared after a loss to University of Northern Iowa Feb. 8. The Ramblers are scheduled to take on Indiana State University in Terre Haute, Indiana Feb. 15. Tip-off is scheduled for 6 p.m. and the game will be broadcasted on ESPN+.